Wright Products most popular standard duty closer. This closer can be mounted on all out swinging storm or screen doors either as a single closer for light or medium weight doors or paired with another standard duty closer (one mounted at the top and the other at the bottom of your door) for heavier full view storm doors. 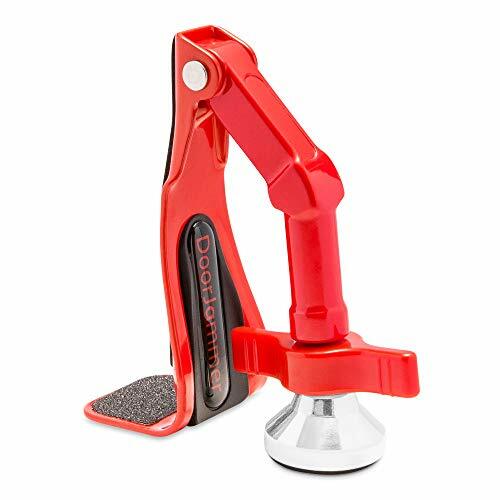 This closer has a full 90 degree opening range, is factory lubricated and has an adjustable closing speed. Available in aluminum, white and black finishes. 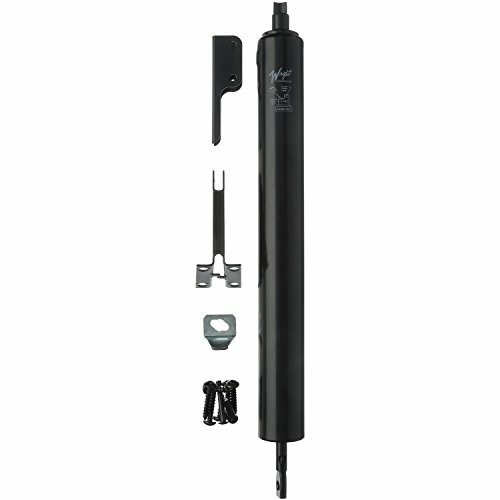 Convert your hinged door into a self-closing one with the KC10HD Safety Spring Door Closer. Installation is a breeze thanks to the closer and plastic slide plate being surface mounted within minutes you can have a self-closing door! 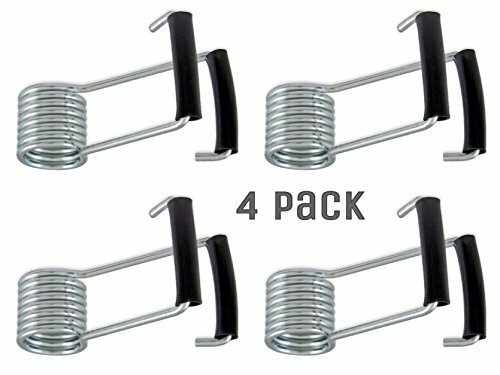 Use this spring door closer on doors up to 150 lbs. It can also be used on both left and right-handed doors. The door closers feature an adjustable closing force and speed. 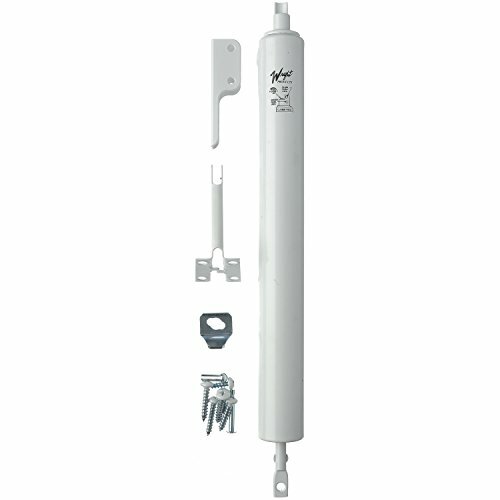 Constructed of diecast materials with a white painted finish, this safety spring door closer can complement any style door. They are U.L. listed with a hour fire rating and have a 1 wide base, 4-1/4 hole center spacing and 4-3/4 arm. These closers operate in a pushing-closed manner, rather than in a pulling-closed method, and they do not have a hold open feature. Distance of travel: The closer arm of this safety spring closer has the ability to swing a full 180 degrees, but once it is mounted in place, the door s distance of swing will be reduced to the point of where it makes contact with the bullet-shaped housing of the closer. For a rust and weather resistant closure, consider model numbers KC50HD (white) and KC57US (brown) which are suitable for outdoor/exterior use, designed for use with lightweight gates and screen doors. All fasteners and installation instructions are included with this item. Other colors/finishes include: black, brown, chrome plated and satin chrome plated. Be sure to view the manufacturer s How-To Installation Video also linked to this page, in the upper left hand corner. Application of white lithium grease to internal compressing springs may be desired, but you should avoid using lubricants like WD-40 which breaks down lubricating grease. 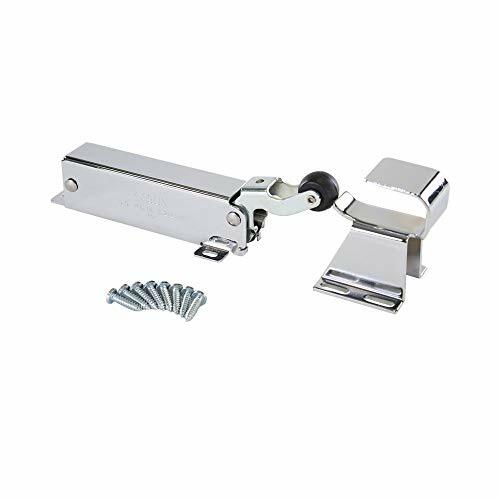 INCLUDES - (1) Surface mounted spring-loaded door closer, tensioning rod, slide plate and hole plugs to cover adjustment holes in closer body after desired tension has been set; works on doors up to 150 lbs; non-handed; adjustable tension; U.L. listed; 1/2 hour fire rated. EASY DIY PROJECT - Thanks to these KC10HD safety spring door closers, your next to-do is quick and easy. Use these door closers to convert hinged doors to self-closing ones. EASY INSTALLATION - With a closer and plastic slide plate being surface mounted, installation is a breeze. This spring door closer can be used on doors up to 150 lbs and can be used on both left and right-handed doors. Easily adjust the tension on this safety spring door closer. INSTALLATION NOTES - To prevent over-tensioning, adjust closer one quarter turn at a time and test door after each adjustment. Over-tensioning can cause spring to buckle. If you wish to add additional lubricant to unit, carefully disassemble unit after relieving tension and apply white lithium grease directly to the springs. 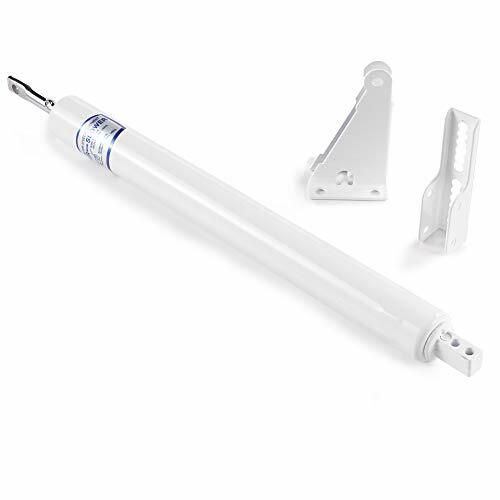 PRODUCT INFO - This safety spring door closer features a non-handed design and White painted finish to complement any style door. 1 wide base, 4-1/4 hole center spacing and 4-3/4 arm. 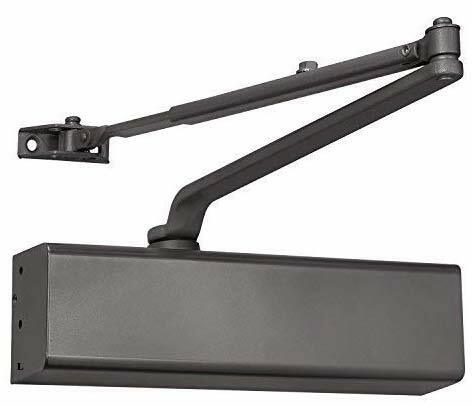 These door closers are only designed to be use on interior doors less than 150 pounds. 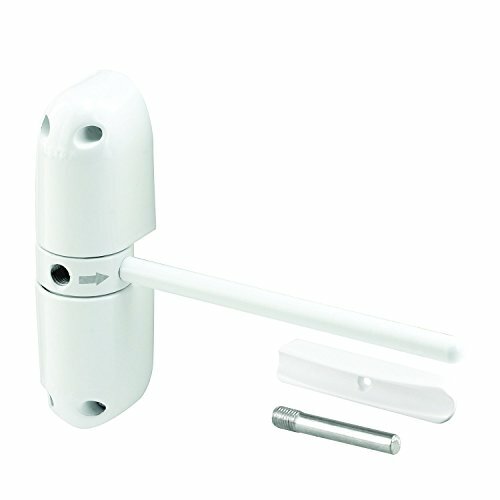 White, heavy duty pneumatic storm and screen door closer, for wood or metal out swing doors, full 90 degree opening. Keep doors securely closed with the FS-1306 Automatic Door Closer. High-quality manufacturing and design plus rigorous testing for quality control. Available for high traffic areas and tested to withstand up to 500,000 open cycles. 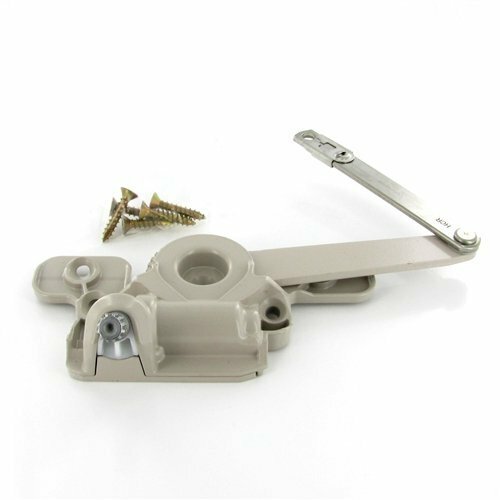 This Door Closer is suitable for interior and light weight exterior door applications up to 145 pounds. Each closer comes with a parallel arm bracket and screws for both wood and metal surfaces. Our unique life-size fitting template makes installation both easy and quick. The automatic door closer is ADA compliant and features adjustable closing and latching speed. We are a manufacturer of high-quality door products and a leader in door technology. The Door Closer is suitable for regular arm installation suitable for interior and light weight exterior door applications up to 145 lbs. - This closer is only suitable for 'regular arm installation' and is not suitable for top jamb, parallel arm' or vertical installation. - This is a domestic closer and is not suitable for large commercial installations. - This closer is not suitable for screen doors or hollow metal doors. If you have any questions about installation, please fire us a message beforehand and we'll be happy to give advice and support 7 days a week. VERSATILE AUTOMATIC DOOR CLOSER - See why hundreds of customers choose our classic automatic door closer - designed for application in medium and low traffic areas. Great for home use, light office use, sheds, ranch and home office at a great price! FITTING INSTRUCTIONS INCLUDED - We've listened to our customers and now include a detailed instruction guide with life size fitting template. Easy and simple fitting helping to save you time and gives a better presentation. The only door closer on Amazon with a a quality INSTALLATION VIDEO makes installation easy! FULLY ADJUSTABLE - With two independent valves you can control both the sweep motion and the catch closing. Self regulate the mechanism to suit your needs. Choose your return close speed to suit the environment in which the closer is placed. QUALITY ALUMINIUM CONSTRUCTION - We use only the finest aluminium, zinc coated for anti-rust protection. High quality steel encased hydraulics tested to endure over 500,000 open/close cycles, for the best in performance. Salt spray tested for 96 hours with perfect results. FULL WARRANTY - If you are not completely satisfied with your purchase, simply let us know and we will offer you a FULL REFUND or REPLACEMENT, no questions asked. RISK FREE purchase from a reputable seller. Level 3 Spring Tension rating. Aluminum alloy shell with sprayed aluminum finish. SPECIFICATIONS: * Tested for 500,000 Cycles. * Body manufactured from special aluminum extruded and machined to extreme accuracy. * Rack and Pinion manufactured from steel alloy duly machined and heat- treated. * Metallic Paint for an excellent and long-lasting finish. * Less load on the door results in smoother closing and jerk-free operation. * Door width 24" to 48" * Maximum door opening 180 degrees * Step by step installation instruction provided in Image # 3. If your unit doesn't have a lifesize template, please contact us and we will provide one ASAP. 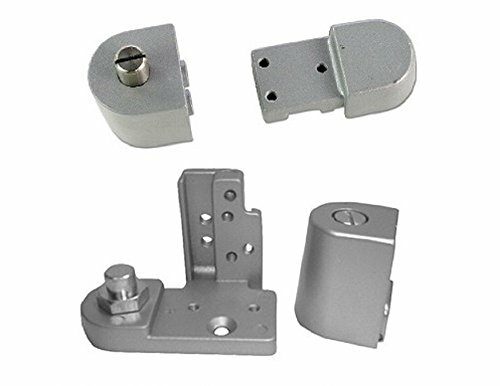 Parallel arm installation: If your door closer requires Parallel arm installation, please buy additional accessory "parallel arm bracket". 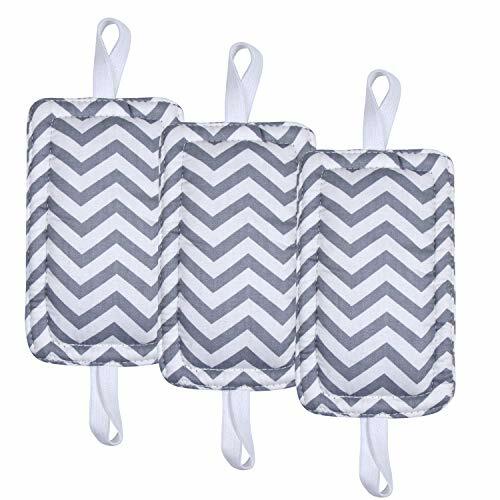 You can search with ASIN B078QSVGWX on Amazon. MODERN & SLICK DESIGN: Advanced technology door closer and the most sexiest and slick piece you have ever seen in this category. Made from high quality metal. Ideal For doors weighing between 132 and 176 pounds. Don't settle for old fashioned door closer! UNIVERSAL MOUNTING for Right Or Left Swing Doors, up to 180 opening. Hydraulic operated. Works with any type of doors - Wood/Metal or Indoor/Outdoor. Parallel Arm installation compatible. EASY INSTALLATION: Improved insturctions! Now includes Life Size Fitting Template & all required hardware - Step by step installation instructions. We listened to customers feedback and improved this part. 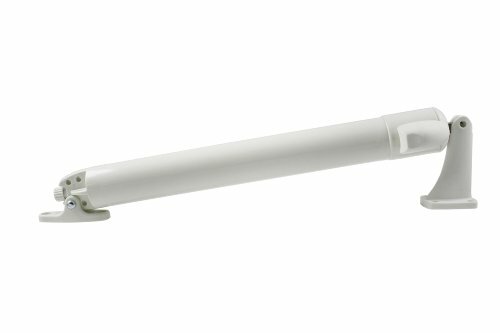 White, Pneumatic Door Closer, For Wood or Metal Out Swinging Doors, Full 90 Degree Opening, 2 Hold End Plug For Summer or Winter Adjustable Latching Power, Adjustable Closing Speed, Factory Lubricated. Operator handle sold separately. For classic style handle in stone color use part #1361358, in white color use part #1361356. Operator cover sold separately. For classic style cover in stone color use part #1361530, in white color use part #1361529. Split Arm Operator, Universal Handing, 1995 to Present. Universal for use on both left and right hand units. Unlike an electric strike access control door lock a magnetic lock has no interconnecting parts.it is possible to bypass the lock by disrupting the power supply. According to the different doors, sometimes will need U brackets or L&Z brackets to support mounting. Can work with networking access control system. The whole system includes electric lock, power supply, access controller,exit button,door bell or RFID cards. These products are widely applied in access control system and related applications. Unlike an electric strike access control door lock a magnetic lock has no interconnecting parts.it is possible to bypass the lock by disrupting the power supply. According to the different doors, sometimes will need U brackets or L&Z brackets to support mounting. Can work with networking access control system. The whole system includes electric lock,power supply, access controller,exit button,door bell or RFID cards. STRONG AND POWERFUL - Our latest updated version of the DoorJammer is now constructed of rugged steel for increased strength. Our latest Door Jammer product twice the size of the original Door Jammer, Made of steel and aluminum to withstand tremendous force. Offers industrial-strength security Designed for multi-room lock-down scenarios and Public buildings, offices and institutions. Designed for durability and ease of use Door Jammer Lock down is a portable, industrial strength door security device that prevents unwanted entry. It takes just moments to fit to any standard internal door, without the use of any tools or pre-installation set up of modifying doors. Once fitted, it uses displacement of force to barricade the door against an attempt at forced entry. Intended for quick deployment lock down is a heavy duty Door Jammer that can be quickly deployed to secure a wide variety of doors, in many different environments. Designed for public buildings or office buildings with a high room count where a situation requiring a total lock down could occur. 12-Month warranty against manufacturer defects we insist on the highest quality materials and manufacturing processes to bring you this superior home security device. Your Peace of mind is imperative so we offer a 1-year money back guarantee against manufacturer defects. Door Jammer lookdown is a portable, industrial strength door security device that prevents unwanted entry. It takes just moments to fit to any standard internal door, without the use of any tools. Once fitted, it uses displacement of force to barricade the door against an attempt at forced entry. Designed for commercial use created for emergency deployment in public buildings, Schools, offices or hotels, this is the last word in portable stopping power. Takes only seconds to install and remove. No tools are required to implement this revolutionary home security device. In case of emergency, you can easily remove the Door Jammer with an upward motion. Compatible with all types of flooring, The innovative System of hinges and angles anchor the Door Jammer firmly to carpeted, tiled and laminate floors when outside pressure is exerted on the door. 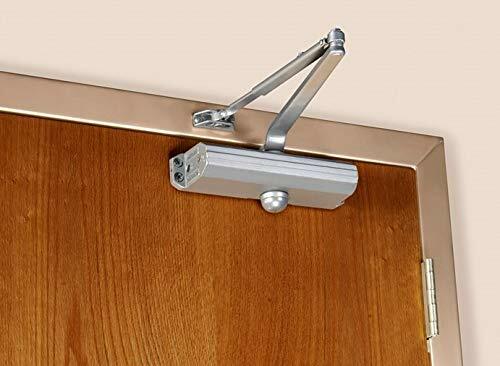 FITS ALL YOUR NEEDS: This Door Closer is totally adjustable and able to be placed wherever you need it, in the top, middle, or bottom of the door. You can choose how fast or slow your door closes, and with just the push of a button, you can lock the door open if you want. SIMPLE AND DURABLE CONSTRUCTION: The costing on the door closer is rust and tarnish resistant to withstand both interior and exterior climates in any area. Its super easy to install or replace your old door closer so you can have it up and running in no time. TONS OF VARIETY: Ultra Hardwares product lines offer a full rand of colors and sizes to accommodate every project and part of your home. Ultra Hardware gives every homeowner an option for that all-important finishing touch to complete a room makeover or renovation. TRUSTED BRAND: Ultra Hardware offers quality products for builders hardware and cabinet hardware. Ultra Hardware products span 14 categories including Storm & Screen Door Hardware, Door Security, Builders Hardware, Gate & Garage Hardware, Home Hardware, Wire Goods and more. PRODUCT SPECIFICATIONS: Package contains (1) Ultra Hardware Glide Door Closer in White. Features adjustable closing speed and latching power feature. One tough button holds door open in any position. May be mounted at the top, middle, or bottom of the door. Easy to install or replace existing door closers. 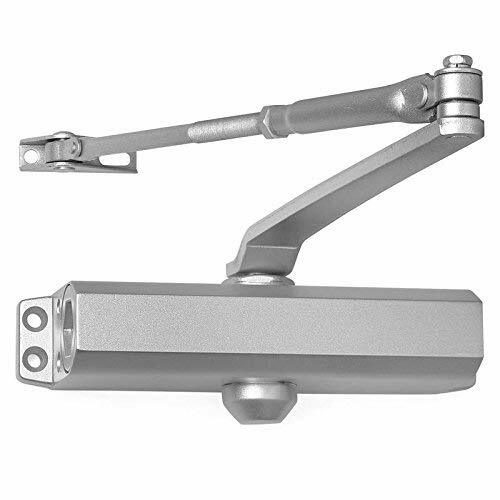 This Kason 1094 SureClose Hydraulic Door Closer is the perfect complement for Kason Walk-in hinges and latches where self-closing doors with controlled closure are needed. Black, Pneumatic Door Closer, For Wood or Metal Out Swinging Doors, Full 90 Degree Opening, 2 Hold End Plug For Summer or Winter Adjustable Latching Power, Adjustable Closing Speed, Factory Lubricated. Works with every Garage Door Opener brand built before 2012! 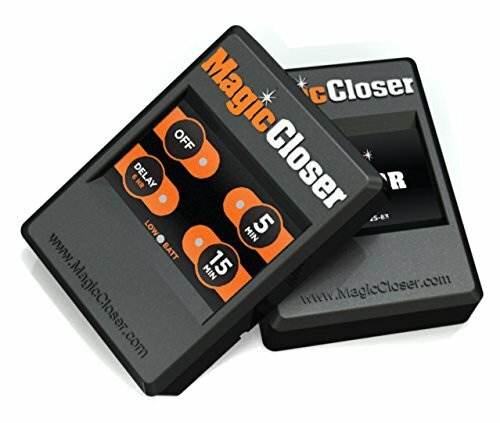 Brand: Magic Closer | Manufacturer: Big Ideas Inc.
1.Hydraulic designed makes no noise and stable enough. 2.Two speed adjustments help you control the speed of closing door and protect your door lock. 3.Detailed introduction attached with the products provide you an easy installation. 1.It's applicable to all doors that are within 60cm-120cm(23.6"-47.2") wide and 45kg-60kg(99lb-132lb) weight. 2.Suitable for warehouse door, fire door, gate, office door, etc. and all kind of different material door. 1.Please be aware that installing a door closer to a light door may cause an open-door laboursome problem, House with children(age under 6) and physical weak people please take this under consideration. 2.If the door and door frame are NOT on the same plane and over 5 cm/1.97" you need buy a parallel installation piece(we do not provide with the package). 3.Please make sure your door weight and width meet our product's requirements, otherwise it may cause some unexpected problems like hard to open the door(if you install on a very light door) or doesn't work well(install on a overweight door). 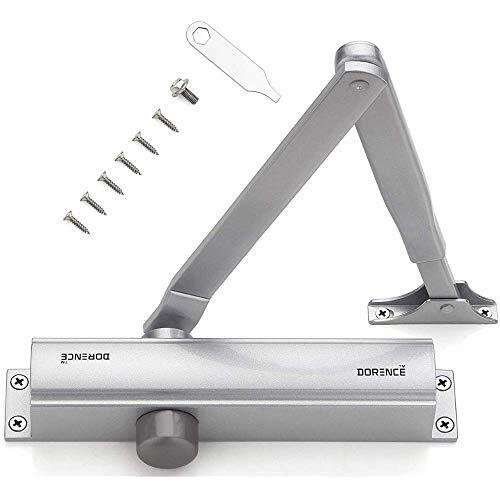 HIGH QUALITY - Hydraulic Door Closer is made of commercial grade aluminum alloy, hydraulic operated, totally automatic closing, speed adjustable, gives you a easy and safe life, protects your door and lock. ALL PURPOSE - Fire Doors Adjustable works with all types of medium doors -- right and left opened doors, wood and metal doors, residential and commercial doors, exterior/interior door closer, fire doors. Door and door frame should be on the same plane and within 5 cm/1.97. APPLICATION SCOPE - Door Closer Commercial applies to door weight between 45-60kg(99lb-132lb) not for light door, door width 60-120cm(23.6-47.2), Door open range 180 maximum. 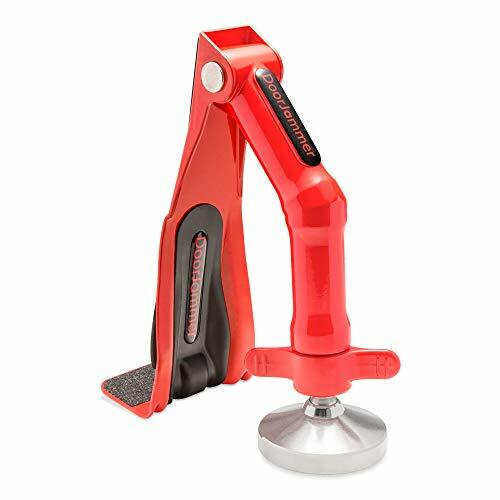 濾 濾SPECIALITY - Antioxidative, anticorrosive, rustless, steady, abrasion resistant, weatherproof, hydraulic, quiet and safe closer, with speed adjustable screws, Tested by 500,000 cycles, oil leaking probability under 1/1000. INSTALLATION HANDBOOK INCLUDED -Domestic Door Closer easy to install, detailed English installation instruction with pictures/handy diagram provided makes you understand easily and install simply. Designer and Architect #1 recommended line of Commercial Door Closers. LYNN Hardware closers are beautifully designed and architectually pleasing to give your entry, storefront, or opening a sharp looking closing devise. 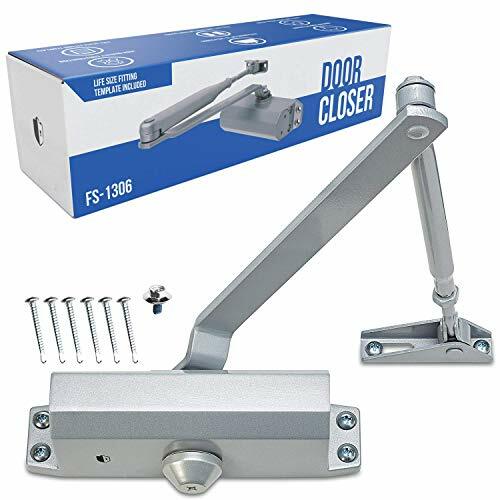 LYNN Hardware DC6003 - - This Door Closer is a Perfect solution for Medium foot traffic areas. An Economical Model for Residential and Light Commercial Doors. UL228 Certified . Designed for medium and light duty commercial applications, both outdoors and indoors. USAGE: Perfect for medium and high traffic entrances such as aluminum storefronts, restaurants, and other public places. MATERIAL: Medium Duty Cast Aluminum. Wrought Steel arm. Powder Coated Finished Body to enhance corrosion resistance. Heat Treated Piston. Designer and Architect #1 recommended line of Commercial Door Closers. 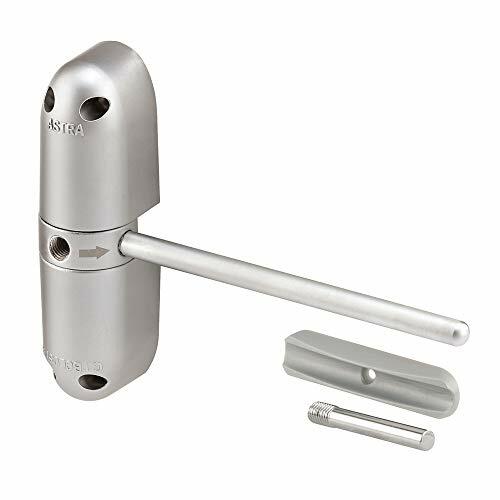 LYNN Hardware closers are beautifully designed and architecturally pleasing to give your entry, storefront, or opening a sharp looking closing devise. --Cast Aluminum. Steel arm. Heat Treated Piston and Pinions. --Adjustable Power Size Range 1-6 (Spring Pre-Set as #3). --Machine and Wood Screws to enable installation in various applications. --Brackets and Soffit Plate to allow Regular-Top Jamb-Parallel Arm Installation. USAGE: Enjoy Automatic Closing and Latching while maintaining Quiet and Secure. Spring Eliminating the need for adjustment right away, the factory Pre-Set as a #3 and the "back check" and Delayed Action valve comes standard on this unit. The commercial-grade arm closes the door slowly enough to allow a graceful entrance and exit, and won't interfere when opening. TRAFFIC: Perfect for heavy and high traffic entrances such as aluminum storefronts, factories, schools, restaurants, and other public places. Can be used both indoors and out. MATERIAL: Grade 1, Heavy Duty, Cast Aluminum to support long-term strength and use. Steel arm. Powder Coated Finished Body to enhance corrosion resistance. Heat Treated Piston. CERTIFICATION: ANSI/BHMA 156.4 and UL/cUL Listed. ADA Compliant. Grade 1: This one has actually surpassed a test of 2 million + cycles! Leadallway Automatic Door Closer,aim to make every Door closers in qualified high-quality in every details, and through vigorously tested for quality control. Available for middle traffic areas and tested to withstand up to 1000,000 open cycles. 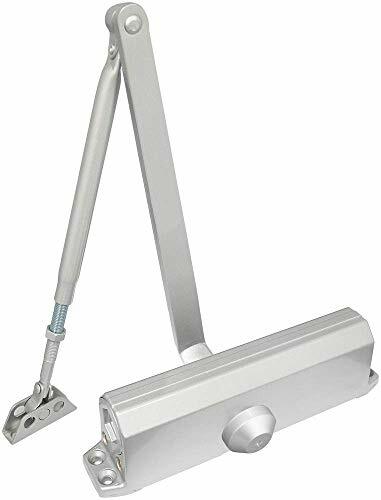 This non-commercial Door Closer is suitable for interior and light weight exterior door applications up to 187 pounds,suitable for many regular arm installation. 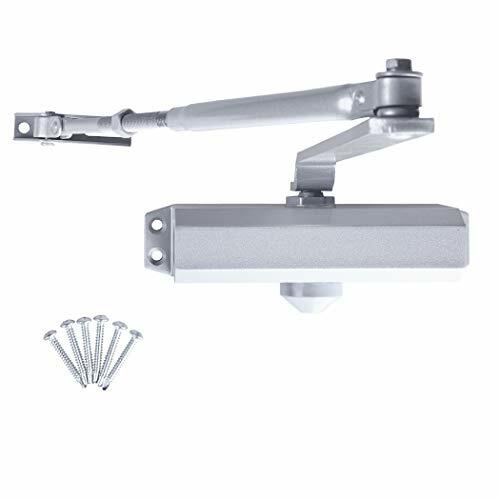 The closer is packaged with a parallel arm bracket and screws . With our life-size fitting template included, installation is easy and quick. The automatic door closer is ADA compliant and features adjustable closing and latching speed. - Very Important!Before installation please read our instruction along with the package or watch our installation vedio under in the same page carefully . - This is a home office closer ,screen doors. - This closer is not suitable for screen doors. If you have any questions about installation, please message us beforehand and we'll be happy to give advice and support 7 days a week. DOES THE DOOR CLOSER SUITED FOR YOUR ACTUAL DOOR? As known, the wider the door,the lighter you are pushing ,and vice versa;Our Hydraulic Auto Door-Closer was designed to a door weight between 145 pound to 187pound,pushing force #3, medium and low traffic areas use. Great for home home office use, light office use, sheds, ranch with adived door width 930-1100 mm).Which is really could not bear a garage-entryway door under a weight 350 pounland . 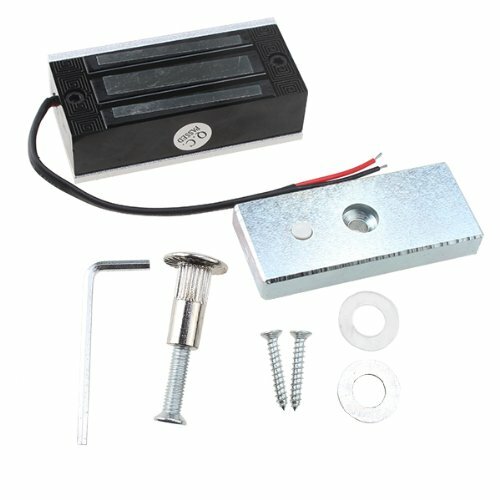 WHY YOU NEED A DOOR CLOSER? You do not know how convenience it is! when you entered the outswing door with lots of stuff in hands and then close it.Our Spring Hydraulic Auto Door-Closer can keep your good manner.With two independent valves you can control both the sweep motion and the latch speed. Self regulate the mechanism to suit your needs.Especially,when you did not want your pet missing or out of the room . HOW ABOUT THE QUALITY THE DOOR CLOSER? 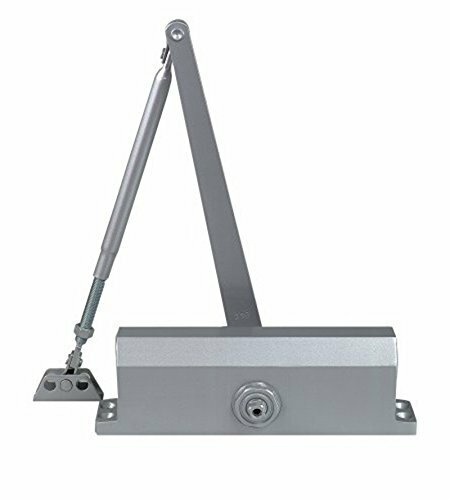 Leadallway Grade 2 versatile automatic door closer,100% out of the factory inspection,high quality steel encased hydraulics tested to endure over 1000000 open/close cycles. Salt spray tested for 96 hours with perfect results,to ensure the best in performance.W/True and effective CE certification and UL-Listed!100% quality guarantee! IS IT WITH A CLEAR FITTING INSTRUCTION? We always care about and strive to inhance our customer`s purchase experience, a detailed instruction guide with clear INSTALLATION Video gives a better presentation and makes installation easy! Any more query also welcome,will be immediately reply within 24 hours. FULL WARRANTY -100% satisfication Guarantee! If you are not completely satisfied with your purchase, simply let us know, FULL REFUND or REPLACEMENT is an essential guarantee. RISK FREE purchase from a reputable seller. The 1600BC Series door closers offer proven quality, performance and reliability unmatched by the competition. A staple in the industry, these ANSI/BHMA Grade 1 closers are designed for exterior or interior doors. All Closers are full rack-and-pinion types with cast aluminum alloy body and are non-handed to permit installation on doors of either hand. The Closer fluid contains lubricity and anti-oxidation agents maintaining stable viscosity to allow door closer to perform in temperatures ranging from extremely high to as low as -40 F.
Typical Applications: Recommended on interior or exterior doors including: Aluminum Storefronts, Office Doors, Utility Closets, Storage Rooms. full rack-and-pinion type with cast aluminum alloy shell, heavy duty cast aluminum body, Spring fixed to size 4, Maximum degree of swing is 180 , trim permitting. Tri-style packaging: regular, top jamb or parallel mounting, Non-handed for installation on right- or left- hand swing door, 2-7/8" projection. High strength aluminum alloy closer body provides for long life, BACKCHECK intensity valves to ensure positive control, Exceeds 25 million cycles, Longer life results in fewer replacements and less material used, Covered by Norton End-of-Life Recycling Program. Norton 1604BC Series, Grade 1 certified & UL / cUL listed for use on fire rated doors and positive pressure fire test. ADA Compliant. Recommended on commercial interior or exterior doors including: Aluminum Storefronts, Office Doors, Utility Closets, and Storage Rooms. Non-Handed for installation on right- or left- hand swing doors. Convert your hinged door into a self-closing door with Prime-Line s KC11US Safety Spring Door Closer. 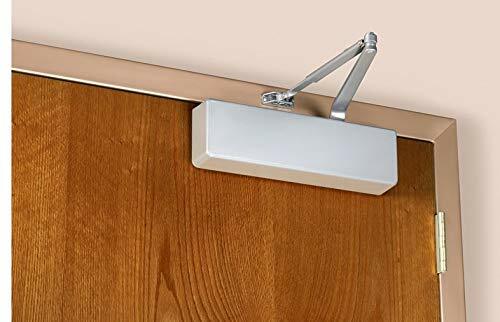 This surface mounted door closer installs in minutes! Use this spring door closer on doors that weigh up to 150 lbs. These closers are not handed, so they can be used on both left and right-handed hinged-swinging doors. 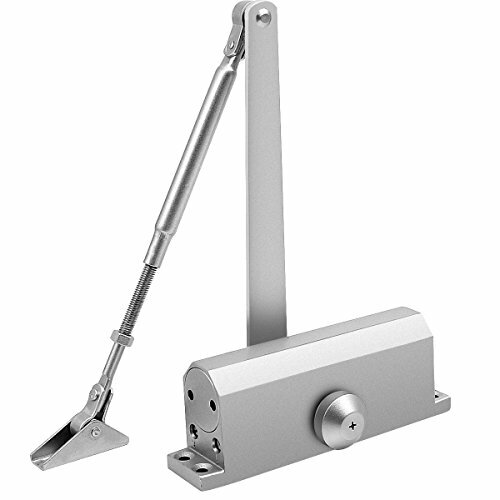 The door closers feature an adjustable closing force and speed. 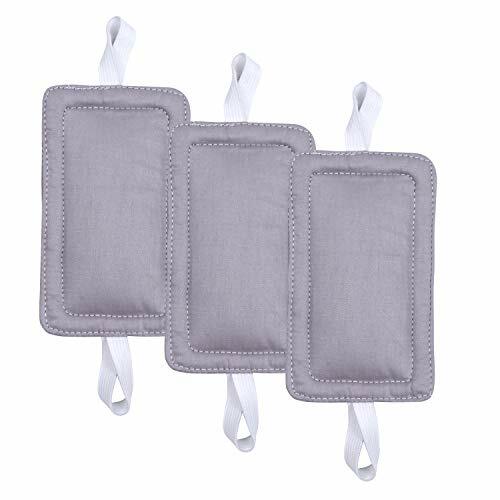 They are constructed of diecast materials and come in a satin chrome finish. These safety spring door closers can complement any style door. Each closer is U. L. listed with a 1/2 hour fire rating. These closers operate in a pushing-closed manner, rather than in a pulling-closed method, and they do not have a hold open feature. Distance of travel: The closer arm of this safety spring closer has the ability to swing a full 180 degrees, but once it is mounted in place, the door s distance of swing will be reduced to the point of where it makes contact with the bullet-shaped housing of the closer. All fasteners and installation instructions are included with this item. For lubrication, avoid using WD-40 which actually breaks down lubricating grease. Instead, apply white lithium grease to internal compressing springs if desired or necessary. Other colors/finishes include: Black, brown, chrome plated and satin chrome plated. For a rust and weather resistant closure, consider model numbers KC50HD (white) and KC57US (brown) which are suitable for outdoor/exterior use, designed for use with lightweight gates and screen doors. Perfect solution for Medium to Heavy foot traffic entrances and exits. USAGE: Perfect for Medium to Heavy traffic entrances such as aluminum storefronts, office buildings and restaurants . MATERIAL: Grade 1 Medium/Heavy Duty Cast Aluminum. Wrought Steel arm. Powder Coated Finished Body to enhance corrosion resistance. Heat Treated Piston. The Norton 7500 Series Door Closer offers customers the ideal combination of superior performance, strength and quality. Ideal for interior or exterior doors in facilities that demand reliability such as Classrooms, Offices, main entrance doors, Hospitals, high use and high abuse doors. ANSI/BHMA A156.4, Grade 1 certified, ANSI/BHMA standard A117.1 certified, UL listed, UL10c compliant for positive pressure, Listed by the New York City Materials and Equipment Acceptance Division. 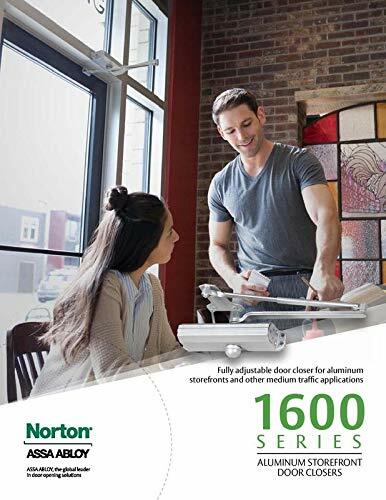 Norton 7500 Series, Grade 1 certified & UL / cUL listed for for positive pressure. Recommended on commercial interior or exterior doors including high traffic & high abuse applications.